I keep my make-up routine fairly simple. I’m not one for heavy foundation or lipstick. I do, however, like to play up my eyes on special occasions. 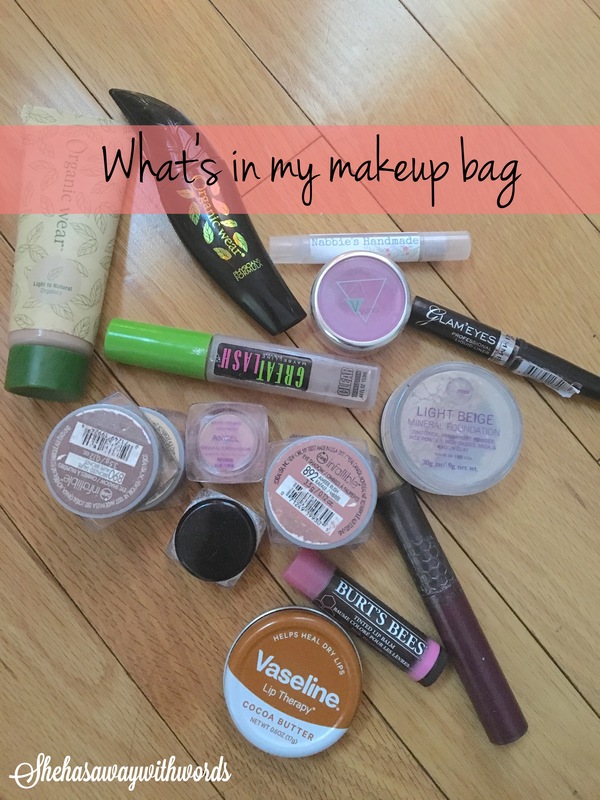 A few years ago, I started the switch to less toxic products, which included my makeup. I’m still on the hunt for a few more all-natural products, but for the most part, I’ve been able to make the complete switch to toxic-free. 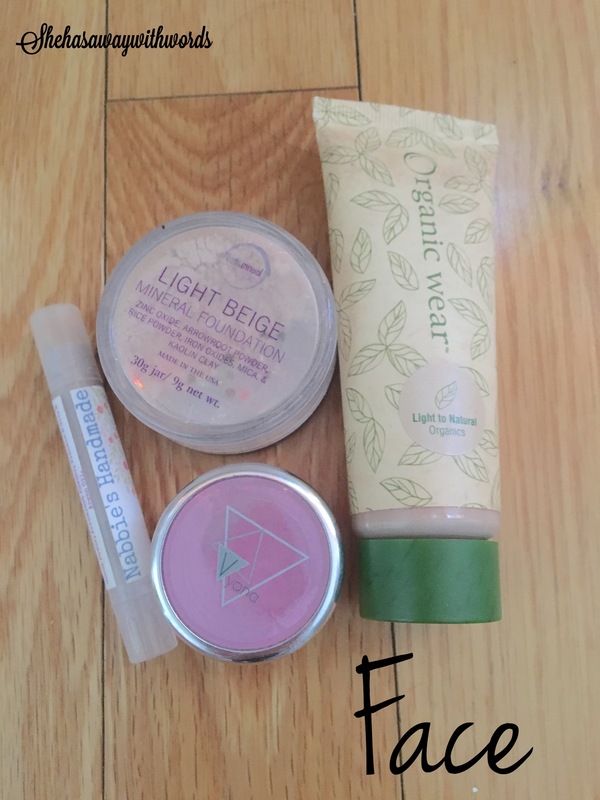 I keep my base light – tinted moisturizer, concealer for annoying spots, mineral powder foundation and baby pink blush. I’m a big fan of Physician’s Formula organic line. Their tinted moisturizer is superb. It moisturizers and evens out my skin tone without being heavy. Next, I’ll spot treat with Nabbie’s Handmade concealor. Nabbie’s products are wonderful and completely natural. 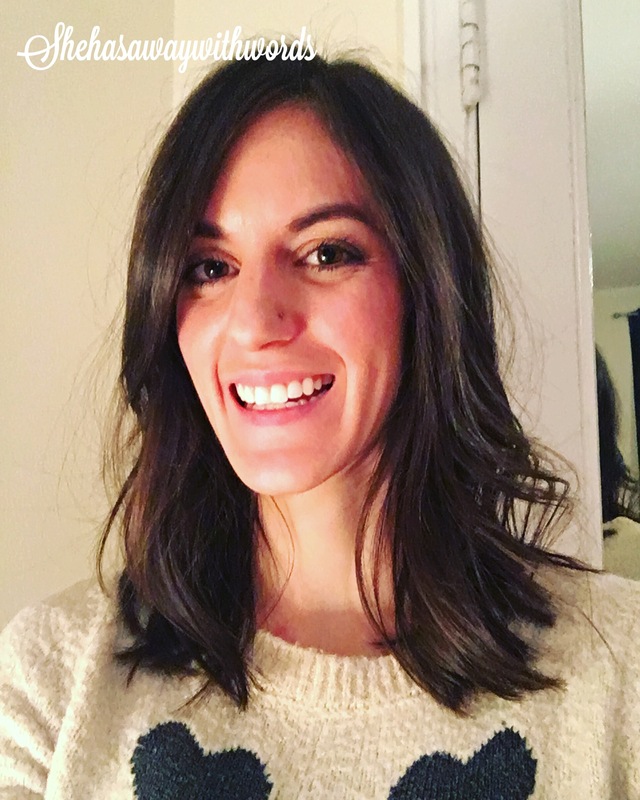 I also use a ton of her skincare products and have seen a huge difference in my skin. Next up is a light dusting of Earth Mineral Cosmetic’s powder foundation. This is another Etsy shop that I’ve fallen in love with over the years. Again, the products are completely natural. The powder foundation is light, lasts all day and feels great on my skin. Last, I’ll lightly swipe Vyana Plant Beauty‘s pink blush on the apples of my cheeks up to my temples to warm up my face. I struggled with finding a perfect all-natural baby pink blush that lasted all day, until I came across Daisy’s shop. She’s based out in Sweden, and her blush is the BEST. Also, totally natural. The only bad part is that since I’m based in the States, the shipping takes a little longer than other products I buy from Etsy, but it’s worth it. On a day-to-day basis, I keep my eye makeup light. On special occasions, I go with a smoky, cat-lined eye. I’m in love with L’Oréal’s infallible eye shadow. I’ve used them for years, and I just love their pretty, shimmery colors and staying power. They don’t do too bad on the EWG toxicity scale, but they are among the few more toxic products I haven’t been able to replace yet. I do use some shadows from Earth Mineral Cosmetics and like those a lot. I’m a huge fan of shimmery golds, taupes, greens and purples. 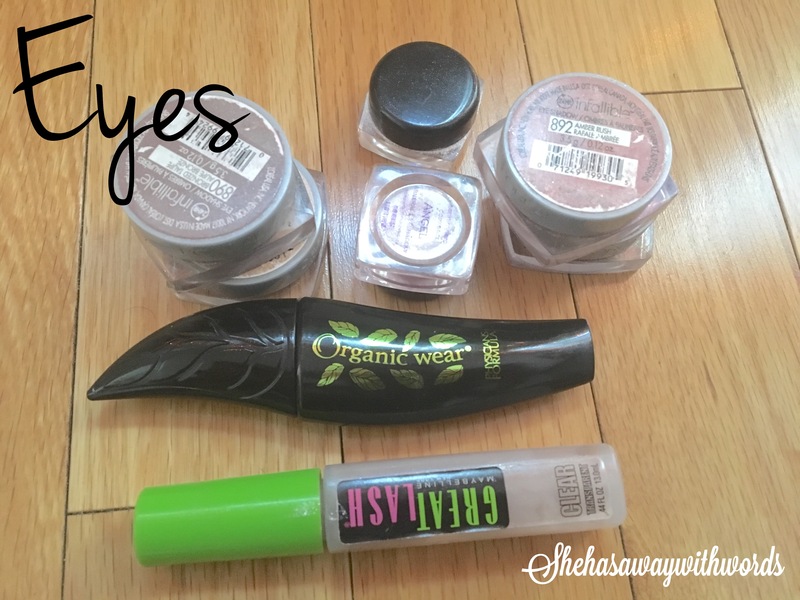 For mascara, I love Physician’s Formula’s organic lash boosting mascara. It doesn’t smudge, and the ingredients are pleasing. When I’m heading out for a fancy night, I’ll line me eyes with Rimmel’s liquid liner. It has fabulous staying power, and the brush is small enough for me to decide on the level of drama I want to go with. Unfortunately, it’s also my most toxic product. I don’t use it often, but I’m still on the hunt for an all-natural liquid liner that stays put. Lots of all-natural liquid liners I’ve tried smudge easily. To end, I fill in my brows a bit with some brown shadow and occasionally brush them out with Maybelline’s clear mascara to keep my unruly hairs in place. Again, I need to find a clear, all-natural mascara for this purpose. Maybelline consistently tops charts with its toxicity level in makeup products. Their clear mascara is no exception. I’ve been eyeing a few natural clear mascaras on Etsy. I’m hoping one of them fits the bill so I can chuck Maybelline’s. Lips are the easiest for me. 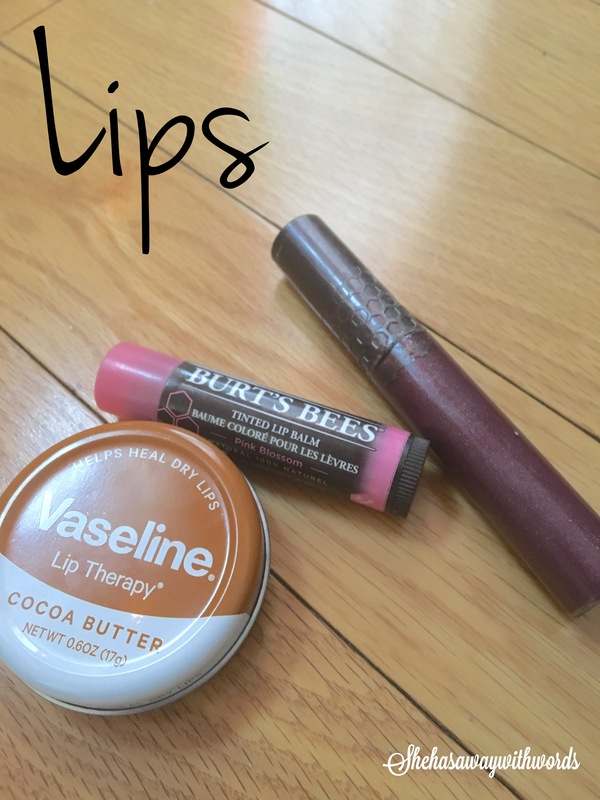 I stick with Esos lip balm or Vaseline’s lip therapy on the regular. For some sheer color, I’ll grab Burt’s Bees’ tinted lip balm in Pink Blossom, which leaves behind a natural wash of color. On very rare occasions, I’ll go with a bold, dark lip, like Burt’s Bees’ twilight shimmer gloss (pictured here). It’s slightly on the sticky side though, and I’m on the hunt for something more natural. Burt’s Bees does OK on EWG’s toxicity scale for some products, but less so on others. This gloss comes in at a 4/10.